The United Nation has designated May 20 as World Bee Day and this year is the first observance of this day. I’m so happy that the importance of these little pollinators is finally and officially recognized globally. Hopefully it will bring a change in the rules and regulations to help make the environment safer for them, protecting them. You can read more about World Bee Day here. We keep a couple of honeybee hives in our garden but we don’t just put up hives for our honeybees. We also put some structures up for native bees as well. There is a good variety of native bees in our garden and they are avid pollinators, especially Bumblebees. Some are an annoyance like Carpenter bees which love to drill holes in our patio beams to put their larvae in. In honor of the World Bee Day, here are some of the little, hardworking friends in our garden. Bee on Goldenrod. I’m not sure what it is. It’s too hairy to be our common Bumble bee. Bees on Onion flower. I think the one on the left is a young Bumble bee. A male Carpenter bee on Butterfly bush. Male has white marking on the face. Bees of the world by Charles D. Michener, ISBN 978-0801-885730. This is more like a text book. I would like to present you with the image of a warmer day in our garden, the Zephirine Drouhin rose. A climbing fragrant rose that blooms continuously throughout the season. One of many things I anticipate again in June. Zephirine Drouhin is never a disappointment. It blooms heavily at first then continues to bloom here and there until autumn. About this ‘anticipation’, I got the idea from a free bookmark I received from the American Horticultural Society of which I am a member. There is a quote from W.E Johns on the back “One of the most delightful things about gardening is the anticipation it provides.” It couldn’t be more true for me. We all hope for better. We hope our garden will fare better than last year, our beehives thrive, our little friends who stay put survive the winter and our migrating friends come back to visit. We anticipate for better so we won’t lose hope. We anticipate that more Monarch butterflies will be back next year as we have plenty of Milkweed and late summer flowers for them to feed on before they travel back south for their winter hibernation. We hope that children will get to see them in real life, not just on screen, for many more years to come. We anticipate the next generation of this Honeybee on Goldenrod will be stronger and more resilient so they can help us humans survive. We anticipate that this summer resident- Baltimore Oriole will bring his children, that were born here, back for a red carpet treatment of fresh oranges and organic jelly. 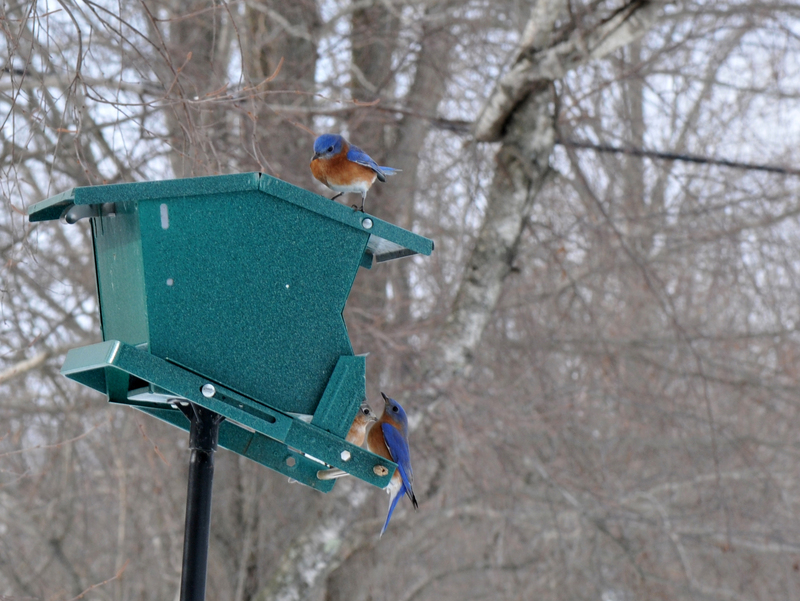 We anticipate that the Eastern Bluebird which has stayed put with us in the last couple of winters, will bring up more kids, enjoy their communal bath and help rid us of pests. 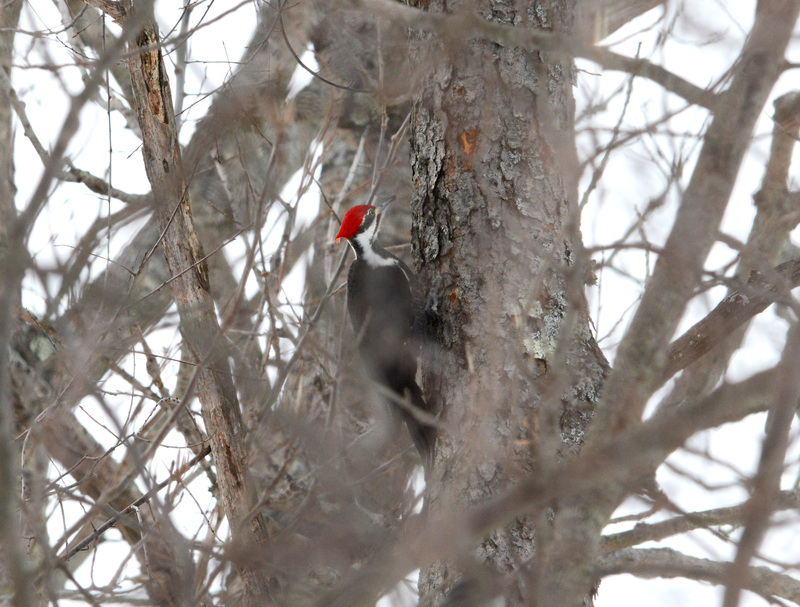 We hope they will continue being our state bird for eons to come since their population has increased in recent years. These are just a few of our anticipations for this year. We have been doing our best to give back to nature since she gives us so much joy. It’s our sanctuary amidst this divided world. As for the world outside our garden, we hope that there are solutions for all conflicts so we stop being so divided and ruining ourselves in the process. We dream of a magic pill that will wipe out hate, bigotry, and selfishness from so many people’s brains, that the world can be a better place to live and a wonderful place to pass on to the next generation. Let’s hope that some of these dreams will come true this year. We cannot lose hope, it’s the only thing that keeps us going. Even if that hope is just a dim light at the end of the tunnel. Whatever your anticipations and dreams are, we wish they came true for you. It’s Christmas day but the weather feels more like mid-spring. The temperature has been hovering around 60° F and the bees have been busy feeding on sugar syrup. Some bees prefer fresh Chinese broccoli flowers which are the only flowers left in the garden. I looked at all the hives and to my surprise they were taking in pollen as well. Not just one or two bees but many of them bringing pollen back to their hives. I have no idea where they are getting pollen from but it’s noticeably two different colors. I hope they are just bringing it back for storage and not for rearing a new brood. It’s the beginning of winter and next week the temperature is expected to drop down between 20-30° F and snow is predicted. We still have two or three more months to go before anything starts to bloom again. Though the third hive is the smallest, they were busy as well. They widened the hole at the top entrance a little bit. I think it might be too hot for them in there so they needed more air circulation. Two days ago it was almost completely closed and it was a little too wet out side from heavy rain. I’m glad they are still active, since they appeared to build up the hive very slowly. If the winter continues to be mild like this I think they will pull through. Sunday was a record breaker for high temperatures in New York. With 67º F in Central Park, it breaks a high temperature record set back in 1923. Where we live the temperature was only slightly over 60º F and it was warm enough for the honeybees to come out of their hives, cleaning themselves and looking for food. Daytime temperatures will stay above 50º F for the next couple of days and they will come to forage though there are hardly any flowers left for them this late in the season. We have insulated all hives for the winter so opening the top to feed them is not an option. We would have to remove the tape, foam, and inner insulation in order to put the feeder in. A front feeder is not an option either because we would have to crack open the entrance to slide it in. Anything we open forces the bees to spend more energy in sealing them again with propolis. So I put the feeder out in the open and let them take whatever they can back to their hives. The advantage of feeding them this way, aside from not having to open the hives, is that they tend to clean themselves carefully afterward. The surface they are walking on is coated with sugar syrup and dry sugar particles that stick to their legs, body and wings. After taking some sugar syrup, they will land on any dry surface near by, myself included, and clean themselves before flying off to their hives. It’s not only to get sugar off their body, also get mites, if any, off themselves as well. The disadvantage of this ‘communal’ feeding is that if there is a disease around it would easily spread from hive to hive. As far as I know, there is no one keeping bees within a few miles but I’m keeping my fingers crossed. I took the opportunity to do a mite count. There were hardly any mites on the corrugated sheet with printed grid that I inserted under the screen bottom board. I keep the sheet on from late autumn to spring, not just for mite counting, but to keep other insects from getting in under the hive and to help keep warm air in. I think they can use all the help they can get to keep them going through the deep freeze of winter. Finished checking for mites, cleaned the corrugated sheet and smeared olive oil on it before inserting it back under each hive. Cleaned birdbaths, added clean water, not just for the birds but the bees drink it too especially when the syrup turns to tiny sugar particles. Thus ends my record breaking mid-December day chores. After all, the bees are my family and family always looks after one another. We are having a warm autumn this year. The daytime temperature is still hovering above 50° F on most days but drops back to slightly above 30° F at night. We had frost for a couple of days early on in the season which killed off most of the garden. So there is not much left for the bees. Honeybees being honeybees, they still come out looking for food when the temperature is above 50° F and to relieve themselves as well. We had fed them in mid-October but now we still worry that their food storage may not be enough for a winter that has not yet come. Since they spend more energy flying around instead of semi-hybernating in the hive during this time of year, they probably have gone through more of their storage than usual. So we are putting sugar syrup out on warm days. They know exactly where the feeder is and zoom right to it. They still go for any flowers they find blooming at this time of year: Alyssum, Chinese broccoli, Broccoli raab and…Saffron. Alyssum, despite being tiny and low to the ground, they weather a light frost quite well. They smell like honey too. I let some broccoli raab flower and it turned out to be a good thing. I should have grown more saffron but I always start small with any newbies. If it fails I haven’t wasted much. My fellow blogger suggested that I may be able to leave them outside since they are hardy to zone 6. I will leave one pot out as an experiment. If they are like other crocuses that bloom in spring (which I grow in the ground) they should be fine. Then I can have plenty of saffron for tea and cooking, and plenty of food for honeybees in late autumn. I couldn’t believe it has been almost a month since my last post. Not that there wasn’t anything to write about but life has been so hectic. Back to normal again at last and with good news as well. 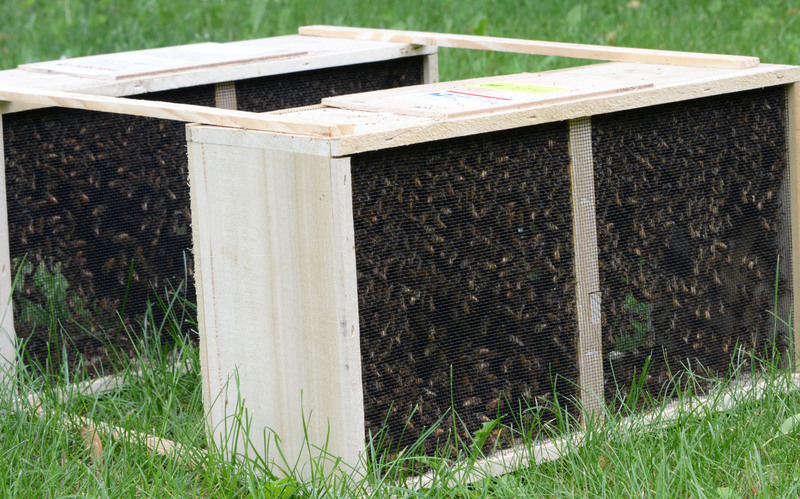 Four of the hives didn’t make it through winter and the one that showed signs of life we weren’t sure of. So, I placed an order for two new packages bees early on. I wasn’t going to wait since the supplier either runs out or they ship too late in the season for the hive to get established properly before winter. The post office called today letting me know that I have to pick up the bees. The Post Office will not deliver live animals to an individual home, period. The weather was also on my side: sunny with a thunder storm in the afternoon. So I picked them up and installed them in their new homes. Two packages of bees. This is how they were shipped. A few things I do during the installation may be a little bit unorthodox like removing the cork from the opposite end from the fondant. But I figured that the queen had been with the bees for at least three days; it was not like I was introducing a new queen to the hive. Also, with a storm coming, she won’t leave. The installation process had gone well except for the Scotch tape that wouldn’t stick to the frame. That caused an awkward maneuver on my part. We are very happy to welcome around 20,000 children to the family. And, adding to this, the surviving hive is very healthy and now threatens to swarm. Here is the hives installation video. Many awkward moments but happy all around at the end. We have over a foot of snow on the ground and it is threatening to drop another 8 to 10 inches this weekend. 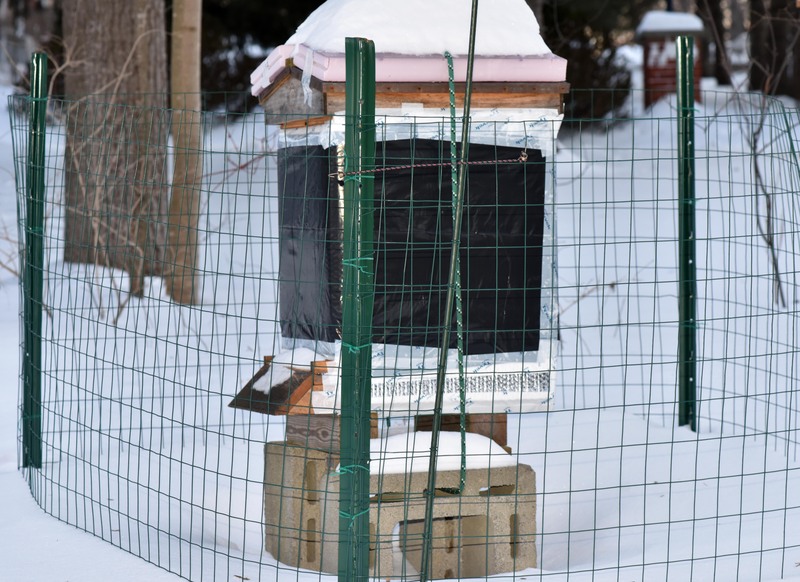 The snow itself is not bad for the honey bees but the frigid cold that follows may wipe out our hives. We have seen a few days and nights of single digit temperatures this winter and today is barely above ten degrees fahrenheit. 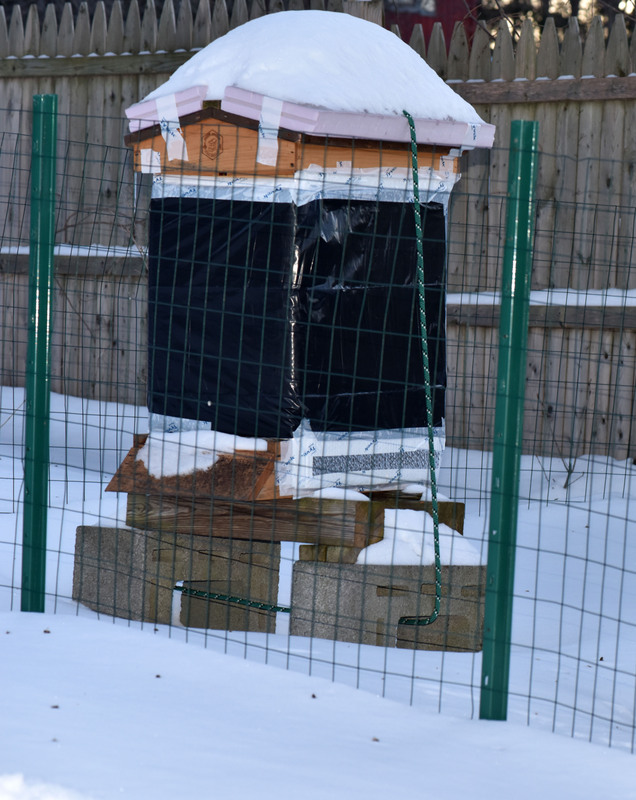 As tightly as I have wrapped all hives with insulation, this winter is unusually colder than normal so I am keeping my fingers crossed. It was a little bit warmer two days ago, above 30ºF, and not windy. Yesterday I decided to wade through snow up to my knees to check on the hives. I know that if it’s warm enough outside, no matter how high the snow gets, the bees will come out. So I was looking for that sign of death outside the hive that would indicate life inside the hive. 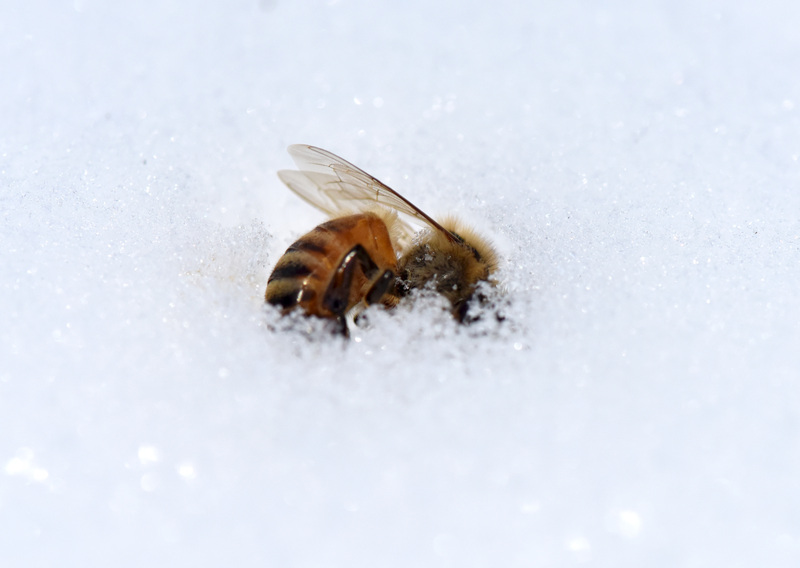 Two out of five hives had some dead bees on the snow in front of the hives. The other three had no sign of activity. 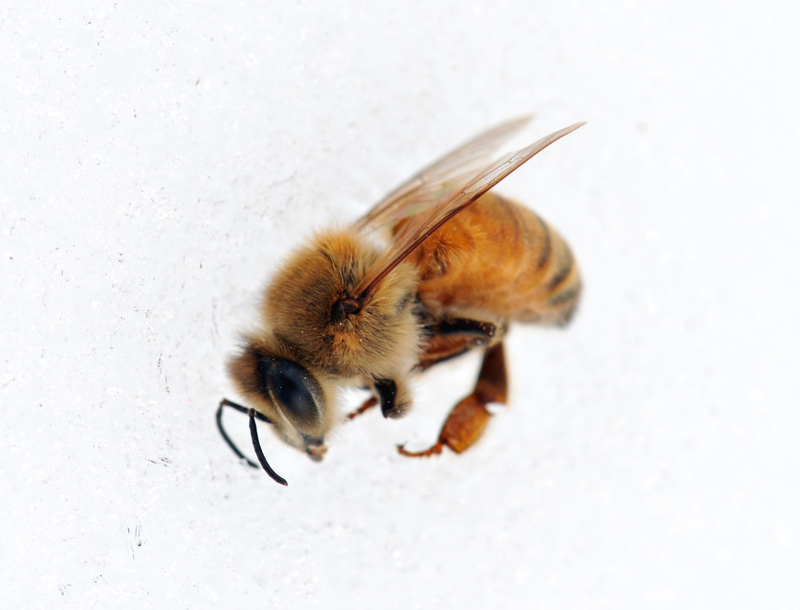 I’m so glad to see these dead bees on the snow. It’s an indication that the hive is alive. There have to be a live bees in the hive to carry the dead bees out. But I haven’t give up on the other three hives yet. They may be trying to conserve energy, staying tightly together to pull through the winter. I won’t know until the end of March or mid-April or when it is warm enough to open the hives for inspection and feeding. At this point they are necessarily on their own. There has been one snow storm after another and the official spring date is still more than a month away. 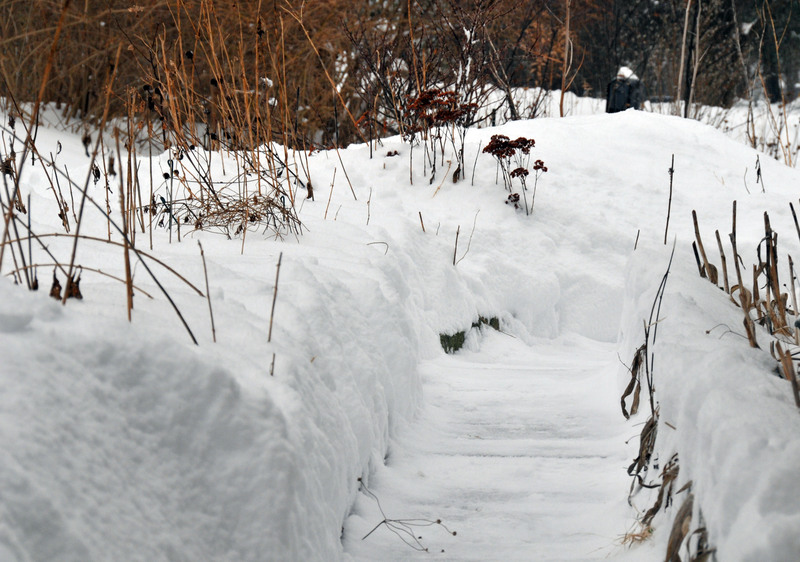 Our garden is covered a foot deep in snow crusted with ice. The cold frame we put up last fall has become an igloo at this point. I have no idea what has happened in there since I can’t have access without digging my way in through snow. I’ve left the honey bees alone. The only sign that there are live bees in the hives is the fresh dead bees I found on top of the snow around the garden. It was very sunny and no wind today so I braved a low 30º F, in my knee-high boots, to stomp around inspecting the garden. As much snow as there is on the ground, there are many signs that spring is not too far away. 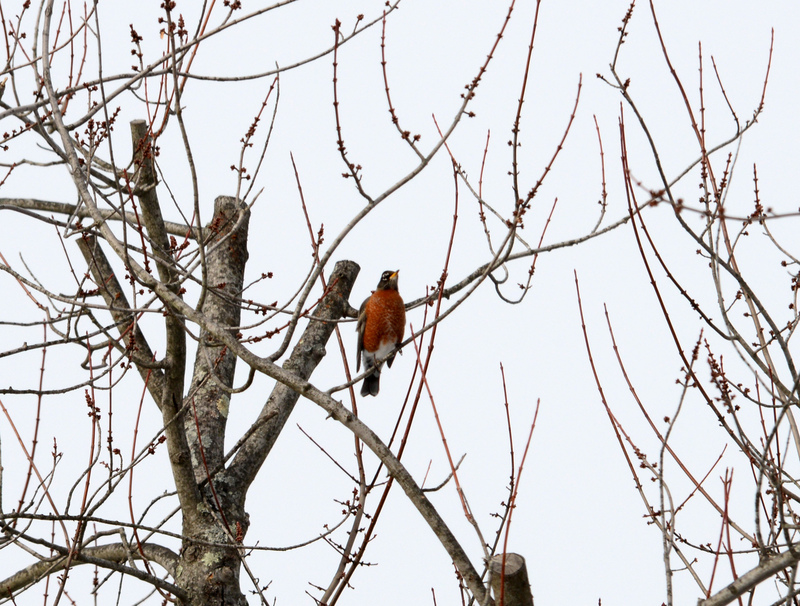 I always see the arrival of American Robins (Turdus migratorius) as an indication that spring will be here soon enough. Today was the second time I’ve seen a large flock of Robins come around. 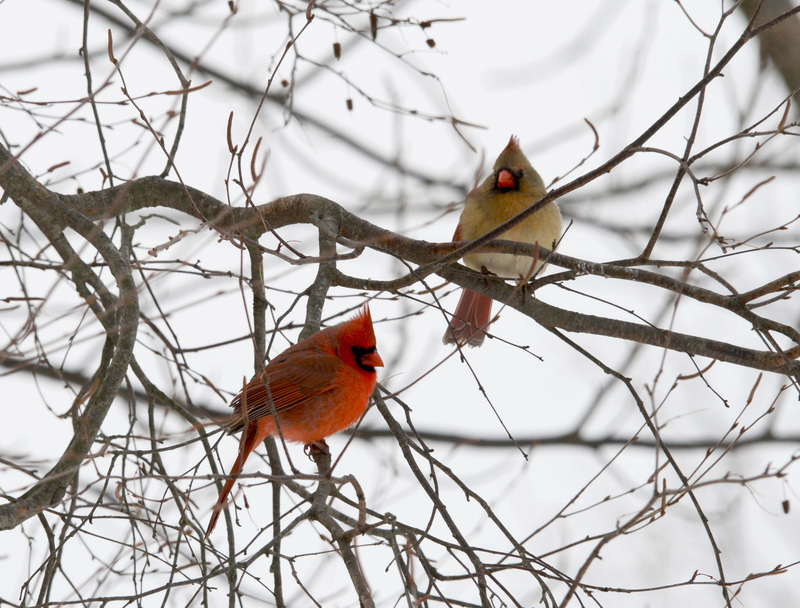 Aside from Robins, the male Northern Cardinals (Cardinalis cardinalis) no longer keep to their truce. They seem to keep close to their female companions now and chase other full grown males around the yard. The Eastern Bluebirds (Sialia sialis) are also looking for nesting spots now and no longer just coming to the garden for food. 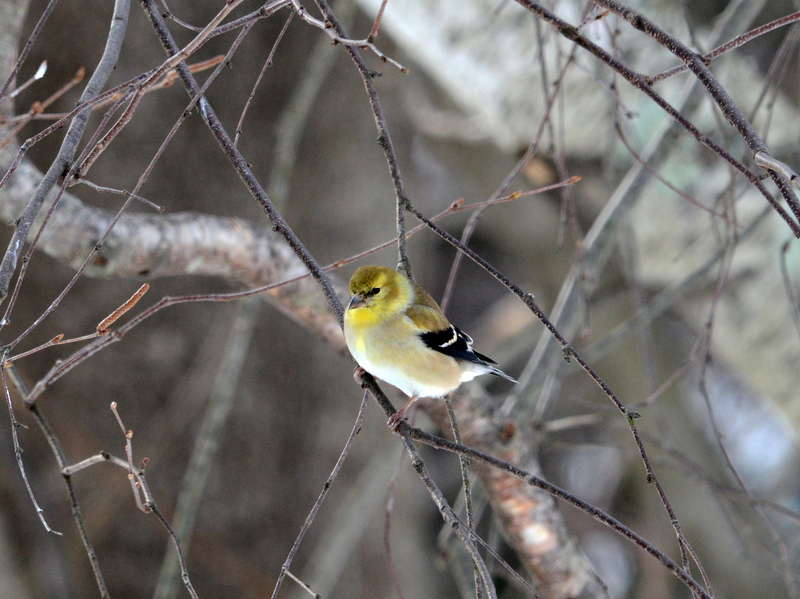 The American Goldfinches (Carduelis tristis) are starting to shed their winter coats. There are little bits of yellow tipped grey down here and there on the snow, and the birds are beginning to show spring colors in bright yellow blotches. With a lineage that stretches all the way back to the dinosaurs, I figure the birds know better than I.